Walk to the beach from this bright and sunny, country style, post and beam home. 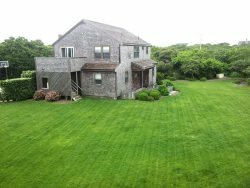 Situated in the quiet neighborhood of Fisher's Landing, with tennis courts and conservation land, we are within minutes of the Madaket bike path and shuttle bus, running in and out of town. The North shore beaches are a short walk through conservation land, for swimming, picnicing, and beautiful sunsets. Lovely and peaceful, Fisher's Landing offers it all: beach, Madaket Harbor, Long Pond, biking, tennis, easy town access, and tranquility! There are beautiful wood floors and plenty of bright and sunny windows throughout this recently renovated, and beautifully maintained home. Water surrounds the quaint neighborhood of Fisher's Landing. Walk to Long Pond for crabbing and fishing, North Shore Beaches on our private footpath through conservation land, and Madaket Harbor to the south, this is a perfect location to enjoy it all. Two well maintained neighborhood tennis courts available.